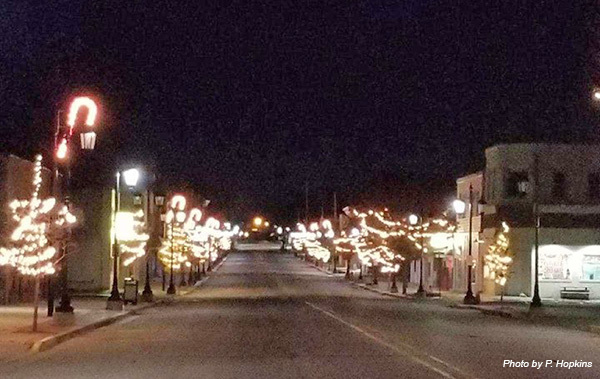 Downtown Cedar Springs is looking more festive and cheery than it has looked in the past decade, thanks to a partnership between the Cedar Springs Area Chamber of Commerce, the Downtown Development Authority, and the City of Cedar Springs. According to Perry Hopkins, who is chairman of the DDA, president of the Chamber, and sits on the City Council, it’s been at least 10 years since the trees lining Main Street were decorated with lights. “They haven’t had them since I opened my business here,” remarked Hopkins, who owns Perry’s Place llc for teas and more. Hopkins explained that Mayor Gerald Hall offered to string the lights and hook up the needed accessories if the Chamber could get sponsors to raise the money, and several businesses chipped in to make it possible. The City Council then voted to pay for the electricity. The Cedar Springs DPW plugged the lights in on Monday and they now come on at dark with the street lights.